I did this walk on Thursday 8th October 2009. In contrast to the heavy rain that had accompanied me two days earlier when out on the Harcamlow Way the day had dawned bright and sunny and stayed that way all day. 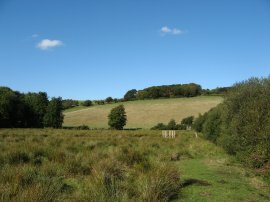 There were no clouds and no breeze which made for an ideal autumn day out walking. 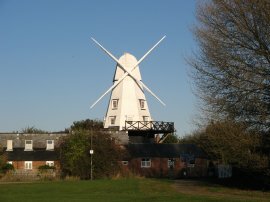 It was market day in Rye and my normal parking spaces were occupied however the car park by the windmill off Ferry Road was almost deserted and left me only a short walk down to the official start point of this walk at the A259 road bridge over the River Tillingham. From here the Military Canal Path, which is not signposted while it makes its way through Rye, follows the main road as it bends round to the left before heading down Harbour Road which is the first road junction on the left. 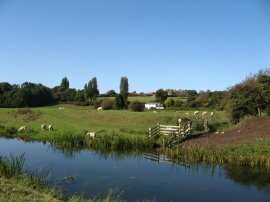 The route only heads a few yards down Harbour Road before it crosses over the River Brede at Brede Sluice, photo 1, and takes a gravel track on the right. 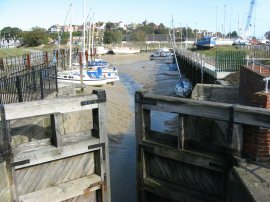 It was low tide and on the other side of the lock gates of the sluice the boats were resting on the muddy bed of the tidal channel, photo 2. The track is followed to some houses where the path bears left, following the route of the Saxon Shore Way on to a grassy footpath that curves round the houses and back down to join the Royal Military Canal, photo 3. 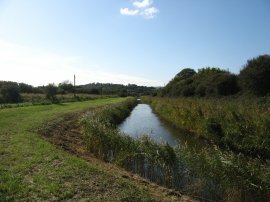 The route heads along side the canal for a while and then bears to the left, away from the canal on a small detour across the Rye Harbour nature Reserve, heading for Camber Castle, photo 4, which grew ever closer as I progressed down the path. 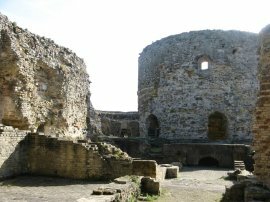 The Castle was shut when I reached it but I was able to have a little look at the grounds, photo 5, through the entrance gate. 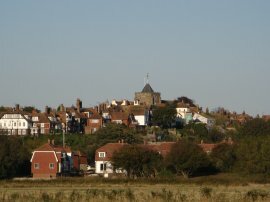 The 16th century castle was built by Henry VIII in 1539 on the coastline to defend Rye Harbour from invasion. 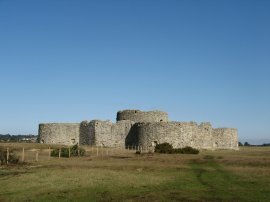 It was subsequently abandoned in 1640 as the receding coastline made it redundant. Leaving the castle the route continued across the low, sheep grazed grassland which now covered the shingle that had surrounded the castle. 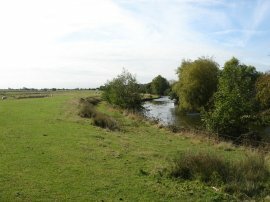 The route gradually curves round to join a gravel track by the River Brede Farm which leads to a minor road where the route turns left. Just after a house which had a number of rather noisy dogs in a cage in the garden, the route joins Seaview Road where the Military Canal Path continues straight ahead. 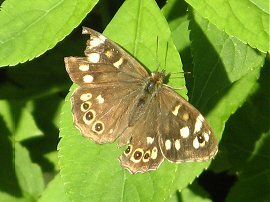 As I was heading towards the road I spotted a Speckled Wood Butterfly enjoying the sunshine in a hedge besides the path, photo 6. Seaview Road is followed almost all the way to the junction with the A259 where the route takes a broad path off to the left, running once again alongside the Royal Military Canal, photo 8. To the right the village of Winchelsea was sitting high on the hill above the canal as I set off on the last few miles of the path. 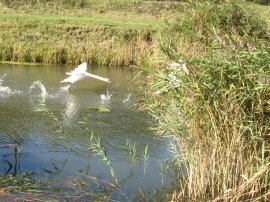 As I went past, a number of swans took off from the canal, photo 7, their wings whirring away as they became airborne. 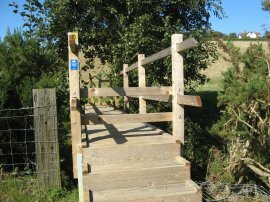 The short section of path below Winchelsea, photo 8, is one of the more attractive sections of the path as the route heads away from the town and out into more open country, photo 9. 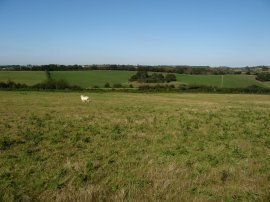 A week earlier I had walked the 1066 Country Trail between Rye and Pevensey (over two days) and on day 1 I had passed besides the farm buildings of Wickham Manor which can be seen on the horizon in photo 10 on the hills above the path. 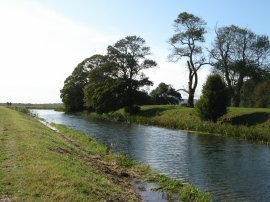 The width of the canal gradually narrows as the canal makes its way down towards Cliff End on a rather dull section of path. 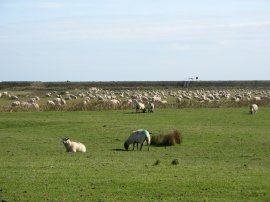 To my left the sea wall grew ever closer across the marshes of Pett Level as I walked alongside fields full of grazing sheep, photo 11. Eventually, almost thee miles from the road at Winchelsea the canal turns to the right, photo 12, running parallel with the English Channel which remains out of view behind the nearby sea wall, as it heads the final few yards past the houses at Cliff End. 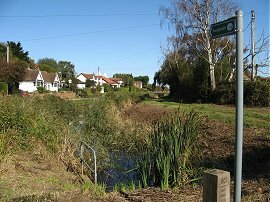 Eventually the end of the canal is reached at Pett Level Road, photo 13, the canal at this point being little more than a narrow ditch. On the day I had walked a further 6.16 miles along the Military Canal Path from Rye which made the total length I had walked along the path of just over 30 miles which is slightly longer than the published length of the canal. 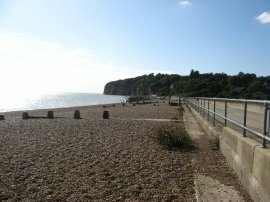 From the end of the canal I headed down along Pett Level Road to the Smugglers Inn pub where I turned to the right and headed up to the beach for a short break. To my left I could see all away around the coast to Dungeness power station and much nearer, on my right, the Sandstone cliffs of Fairlight beginning to rise above the sea, photo 14. After a nice rest besides the sea I headed a short distance along the seafront to join a footpath that I had not noticed before which runs past a caravan site back to the Pett Level Road, very close to the end of the canal. 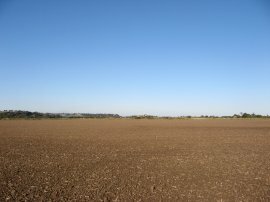 From here I headed along the Pett Level Road from where, just after the road junction to Pett Level village, I finally left the route of the Saxon Shore Way and of the paths I had walked before to join a footpath on the right that headed over a field towards a farmhouse. Heading past the bottom of the farm house the footpath turns to the right to cross over a marshy stretch of ground, photo 15, before heading diagonally up the hill ahead. At the end of the marshy area I crossed over a new, and sturdily constructed wooden bridge, photo 16, which was a welcome sight to see and suggested some active investment by the East Sussex County Council in the local footpaths unlike much of the Kent County Council area's of Romney Marsh I had crossed on previous walks along the Military Canal Path. 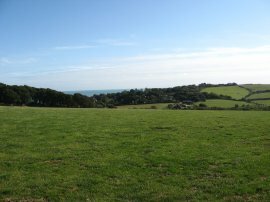 From the top of the hill there were good views back down to the nearby coast as well as the hills of Firehills and Fairlight, photo 17. The footpath then headed over two more grassy fields to join a road on the outskirts of Pett Village. Here I turned to my left and followed the road before turning to the right along Elms Lane by an old pub. After a few yards I then joined a footpath on the left that heads besides a house and out into a field. The route crosses over this field and into a second field (where I went slightly off course as a number of field boundaries marked on my map no longer exist); the route of the footpath heading more or less in a straight direction downhill to the bottom of another valley before passing through a hedge and turning to the right before heading to the left along the field edge back uphill to Pannel Lane which runs along the horizon of photo 18. At Pannel Lane I turned to the right and headed along the road for a short distance before joining a bridleway on the left which one again headed downhill to cross the bottom of a valley before ascending uphill on the other side towards the village of Icklesham which is on the horizon of photo 19. From Pannel Road the path heads downhill through an area planted with a variety of different bushes, many of which were laden with berries. At the foot of the hill the route continues over the valley floor towards a concrete bridge over a drainage ditch before turning half right and heading gently uphill to a metal gate the marked the entrance to a rather overgrown, hedge lined track. A number of the gates in this area had been a bit lopsided and this gate was only suspended by its top hinge which made opening it rather heavy and tricky. There were also no footpath signs in this area so I had to consult the map a few times to ensure I was taking the correct route across the valley towards Icklesham. At the top of the hedge lined track the route enters a grassy area besides a pond before crossing over a stile on the right and heading up to the farm yard of Knockbridge Farm. 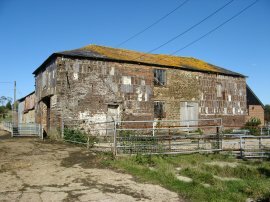 The footpath passes the rather patched up barn in photo 20 and continues heading uphill along the driveway that leads to the farm for a short distance before passing through another metal gate on the right and heading diagonally over fields and past a house to join the road at the junction of Laurel Lane and Workhouse Lane at another new and impressive stile. At the road, I headed along Workhouse Lane before briefly joining the 1066 Country Trail which heads along a footpath that leaves the road on the right, running besides an orchard to the All Saints Church, photo 21. 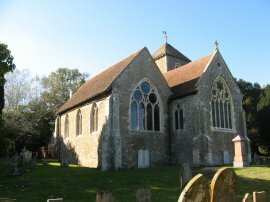 Here I left the route of the 1066 Country Trail and headed through the churchyard to reach the A259 "Main Road". At the main road I turned to my right for a very few yards before joining a footpath on the other side of the road that runs to the left of a house and heads downhill along a concrete lined track. Close to the top of the hill a wooden post with a notice on it caught my eye, lying amongst a clump of nettles which mentioned the footpath being closed. 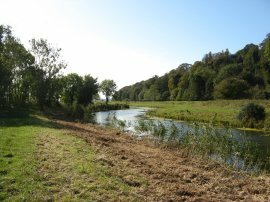 I didn't read all the details but the notice was dated from way back in February 2009 and as the post was lying down I continued ahead down the hillside towards valley floor of the River Brede. To my right as I descended I could see Rye in the distance, photo 22, and ahead of me the broad level valley floor, photo 23. The path continues ahead, across the valley for just under half a mile before crossing over a railway line and heading up to a wooden footbridge over the River Brede, photo 24. Attached to this footbridge was another newer notice from September 2009 regarding the footpath closure which had been extended for another six months from that date. Reading this notice more carefully it referred to a dangerous bridge. 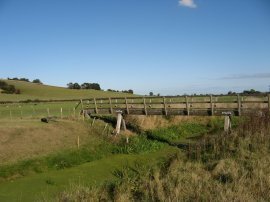 Looking back the way I had come I noticed that a broad bridge, taking a farm track over a drainage ditch that ran between the River Brede and the railway line did indeed have few bricks that had collapsed on one side however I hadn't even notice this when I walked over it. However officially the footpath across the valley floor is currently closed (as at October 2009) and I cannot advise its use and further strongly recommend that anyone following this walk follows the diversions listed on the footpath closure notice, although hopefully the path will be re-instated in the near future. 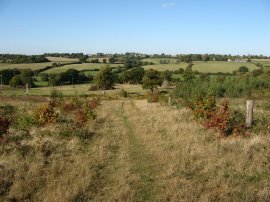 The footpath involved is Icklesham 26a and the notice states that further details can be obtained from the Rights of Way Office on 0345 60 80 196. 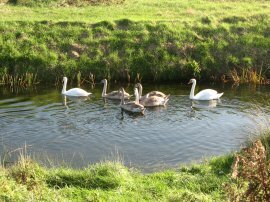 Reaching the River, I then turned to my right along a footpath running along the river bank that almost immediately crossed back over the railway lines to join a path running over the valley floor with the river on the left and a drainage ditch on the right where I spotted another of the many families of Swans I had seen during the day, photo 25. 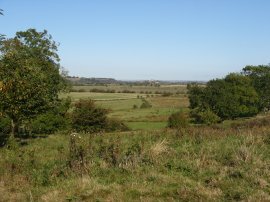 The afternoon was bright, clear and the air still and I stopped by a stile and had an enjoyable rest, sitting in the warm sunshine admiring the views over the valley towards Winchelsea, Rye and the surrounding hills, realising it was likely to be the last such day of the year. 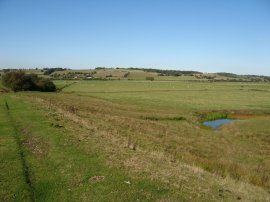 Continuing on my way, I followed the footpath as it made its way back over to the other side of the valley floor, below the village of Winchelsea which remained just out of sight on the right. 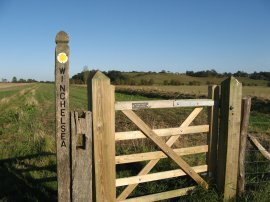 Below Winchelsea, I once again linked up with the route of the 1066 Country Walk for a short distance along a footpath that heads past a small sewage farm back to the A259. Reaching the road I turned to my left along Station Road before joining a footpath that leaves the road on the right just after the road has crossed over the River Brede. This footpath headed diagonally across an large open ploughed section of field, photo 27, before heading back onto grazing land running alongside the Padiaham Sewer which is in fact another of the marshland drainage ditches rather than an actual sewer. 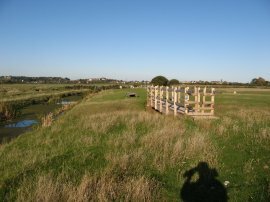 Heading alongside the drainage ditch I crossed over some more new wooden footbridges, photo 28, before eventually joining a path that runs along the edge of a field with the town of Rye growing ever larger in front me, photo 29. Leaving the field the footpath joins a farm track that heads past a small industrial area and back down to the A259 on the outskirts of Rye from where it was just a short walk back to where I had parked my car at the start of the day, photo 30. 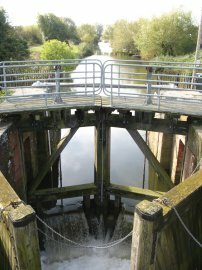 This had been a very enjoyable walk and I was also pleased to have finished my walk along the Canal Path. 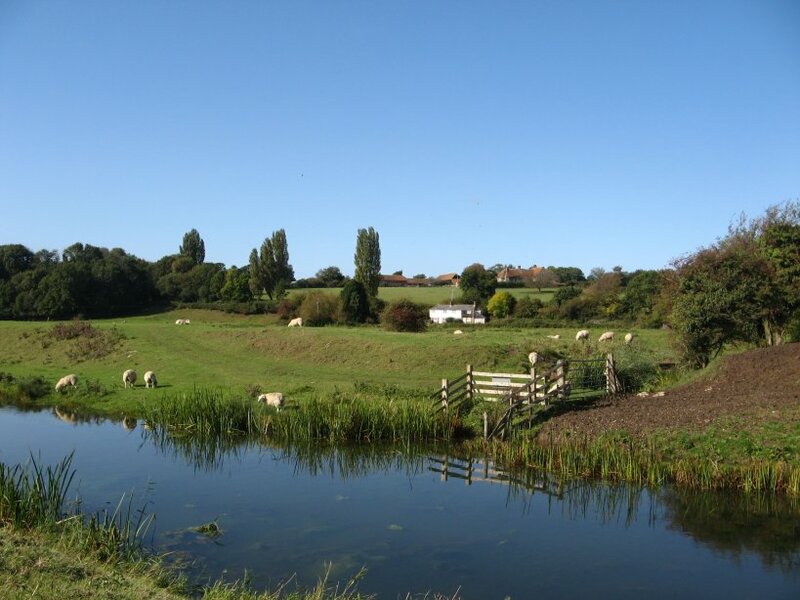 The fantastic weather helped but the scenery particularly from the end of the Royal Military Canal Path, crossing over the gently undulating hills from one valley to another and back to Rye, was worthy of day out in its own right. I always enjoy devising my own routes across the countryside and following some of the lesser used, and perhaps harder to find, footpaths and this had been a particularly good choice of paths. Reaching the car I had walked a total of 14.2 miles.